GOM Player lately is one favorite multimedia player that have a lot of user. Even some peoble say that GOM Player is better than Window Media Player Classic. They assume that GOM Player lighter compare with Window Media Player. On this opinion, I do not have authentic data. Obvious advantage is the GOM Player can play AVI files are damaged or are still in the process of downloading. Perhaps this advantage is not possessed by other multimedia player. But at this time I will not discuss about the advantages and disadvantages. I will discuss is how to take/capture a snapshot or screenshot of the video that played on the GOM player. Actually take a snapshot GOM player quite easily. 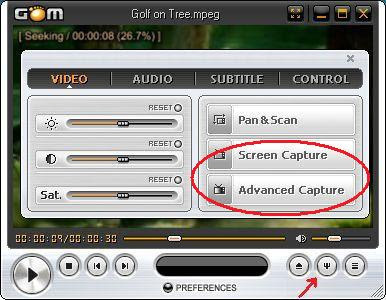 Moreover GOM player has a feature called "Burst Capture" that allows for you to take snapshots up to 999 shots. That information I got from the official website. Well you can start by following steps one by one. The first step is, of course, play your video on the GOM Player. Click text "GOM" on your GOM Player (place at top left player). Browse your video file and then you push enter or click "Open". Choose the video image which would you take in a way pushed the button "Pause". Than press GOM Player's "Control Panel" button on the bottom right of player. You will see new window as shown at the picture below. "Change directory", its function is to change the destination directory folder where your image file snapshot will be saved. "Image format", what file format you choose for your snapshot files. Usually there are two choices of JPEG and BMP. "Capture" button to instantly take a snapshot. 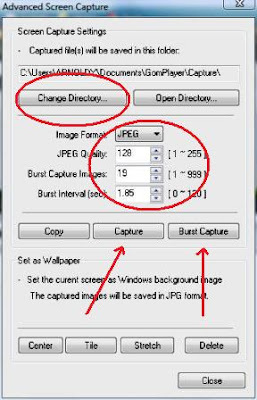 "Burst Capture", to take a snapshot of continue until 999 shots. Even you can also instantly makes your snapshot image as wallpaper with a choice center, tile or strecth. When you finish your stay "close" the window. It would be better if you are setting up your destitination directory folder first, so you are not confused to find your snapshot files. Good luck and try!